About a week before Christmas 2009 Chuck Daellenbach of the Canadian brass called to ask if I would be interested in helping the ‘Brass’ make a recording of American patriotic music for The American Heritage Society. Chuck wanted to use rope tension field drums. He knew the sound of these instruments quite well because we had played a concert together in the Glenn Gould Theatre in Toronto about eight years earlier. I had made an arrangement of four prominent military songs for the Canadian brass and Nexus which was premiered on that concert. At that time Chuck and I talked about the possibility of piccolo trumpets playing music intended for fifes. Chuck had remembered that conversation as well as the sound of the rope drums and when the American Heritage Society contacted him, he immediately thought of me and my interest in-fife and drum music, and my rope drums. The brass arranger for this recording would be the venerable Canadian musician Howard Cable, who incidentally, lives just a couple of blocks from my home. When Chuck mentioned me to Howard, Howard suggested that he and I get together. I have known Howard for probably 40 years. He has a distinguished career in Canadian music as a producer, script writer, conductor, composer and began his association with the Canadian Brass in 1977. Below this article are some photographs from the recording sessions. They show the drums used for the recording. 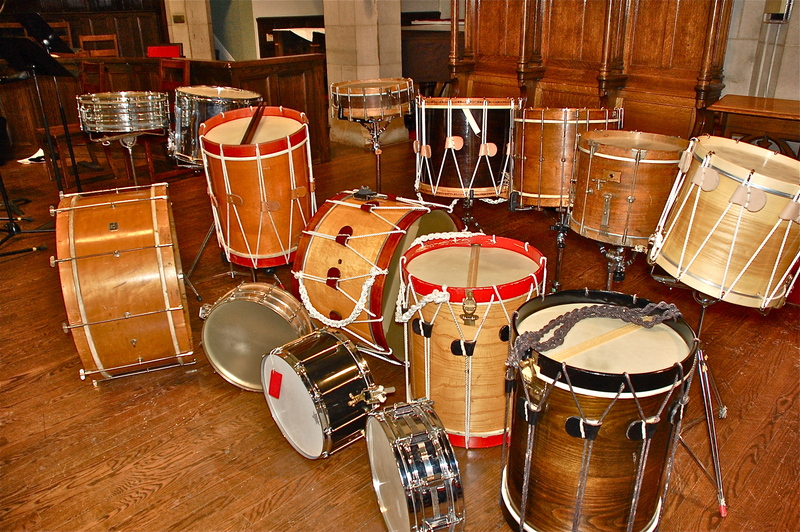 I think the collection of drums is impressive, and it seems quite possible to me that no recording in the past has included such a large and interesting array of snare drums, bass drums and cymbals. I wrote each arrangement with specific players in mind. I had asked Chuck to engage Bob Becker and Russell Hartenberger, former colleagues of mine in Nexus, and Ryan Scott a former student who is now one of the most sought after percussionists in Toronto. All of them are expert drummers and fine musicians who appreciate the particular style of drumming I employed in the arrangements; that is, the “Ancient” or “Open” style prevalent during the 18th and 19th centuries. Drums used on the recording sessions. Ryan’s Noble and Cooley Birch Snare Drum (with Patterson cable snares) 14″x8″-Rogers Dynasonic 14″x5″ (ca.1967). Bob’s Cooperman Liberty model, 17″x20″, calf heads, gut snares, (1981). Robin’s Cooperman custom made (for this recording) snare drum, ash shell, brass hooks, calf heads, gut snares. narrow hoops, modified Liberty strainer, 14″x12″ (2010). Chuck Daellenbach, Bob Becker, Russell Hartenberger, Howard Cable, Ryan Scott & Robin Engelman. The works recorded consisted of marches and songs written during a span of time beginning with the American war for Independence and ending soon after the First World War: Chester by William Billings, the 1814 and 1931 versions of The Star-Spangled Banner, Dixie’s land, Stars and Stripes Forever, National Emblem, Battle Hymn of the Republic, Johnny Comes Marching Home, Hail Columbia (The President’s March), America, a selection of George M. Cohan songs, a medley of U.S. military service songs, and also, O Canada. 1. The CD “Stars & Stripes” is now available to the public. Fascinating foray into acoustic history. I look forward to hearing the recording. Hi, I’ll have to get out and get one of these ASAP. HOpe all is well with all of you and this is very successful! Appreciating the time and effort yyou put into youir blog and detailed information you present. It’s good to come across a blog every once in a while that isn’t tthe same outdated rehashed information. Excellent read! feedds to myy Google account.